Originated in Southern China 4000 years ago. Has been used by China for 3000 years. Introduced to the western world in the 17th century and since then the Britain's have become the worlds greatest tea drinkers. 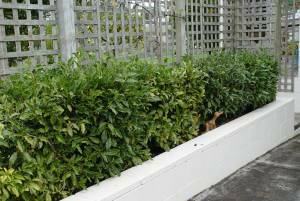 Will create a stunning medium sized hedge to 2 metres, providing both privacy and numerous 'cuppas' for your visitors. Otherwise plant as a specimen in your garden. Has been linked to cancer prevention and to anti-aging effects. Harvest the first 2 leaves and the bud, dry the leaves for 17 hours in the shade. The air must be able to circulate around the leaves. Your leaves are ready when they are squeezed into a ball and stay in a ball. Put the dried leaves through a meat mincer or finely chop and crush so the leaves are bruised and the flavour is released. Spread on a tray 25mm thick and leave for a hour, turn and leave for another hour. Using an old fan heater with a steel mesh frame above, heat the frame, place your leaves on the frame and turn occasionally until dry, aim for the bought tea affect. Store in a air tight container (not plastic) away from light, moisture and heat. Loose tea should have a shelf life of two years. 5-6 year old plant will yield about 1 kilo of leaves which will produce 200 grams of dry tea. Northerly aspect. Can grow in full sun but prefers light shade. Protect from wind. Not salt tolerant. Needs regular watering and good drainage. Frost tender but will tolerate brief frosts though it does require protection from frosts while young. Free draining soil (on the acidic side), mulch to conserve moisture and suppress weeds. Apply acid fertiliser in spring. Prune regularly to form a dense bush. Cut back every three years to keep the plant at the desired height. Pruning encourages new growth and forces new shoots to develop horizontally to the top to the plant creating a flat surface to harvest the most tender shoots. Hardy to -5°Cs. The frost will burn the tips of the branches.